Social Media makes us less social? The quote above is from Sherry Turkle from her book called “Alone Together: Why We Expect More from Technology and Less from Each Other”. More and more people state that Social Media makes them less social. Even I did it on my personal blog a couple of times. But is it true? Social Media, in my opinion, is a great development on its own. Technology makes it easier for us to communicate and keep in touch with others. Technology makes it also easier for us not to have interaction between each other. Why call someone if you can leave a quick message at their Facebook wall or @Tweet them? We fear the risks and disappointments of relationships with our fellow humans. We expect more from technology and less from each other. A lot of people rely too much on the digital world and digital contacts. They expect too much from each other when they are communicating online. But does this make Social Media bad? In my opinion the answer would be a big ‘no’. I think it’s more a case of decency. Social Media takes a lot of time. At least this was in my case. The whole day we are busy to connect with each other. We send a tweet, we change our status on Facebook or we change the status on our LinkedIN profile. But if we meet each other in ‘real life’, face to face, and there is a small silence we grab our smartphones and do whatever. Making a quick sidestep to the digital world, you might miss something! We’re using inanimate objects to convince ourselves that even when we’re alone, we feel together. And then when we’re with each other, we put ourselves in situations where we feel alone, constantly on our mobile devices. 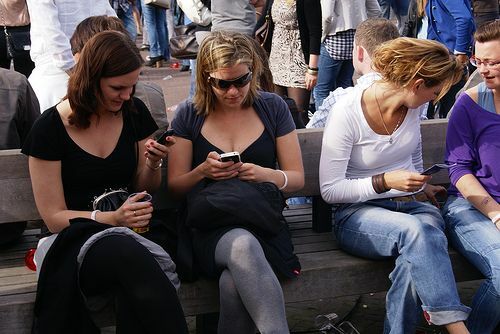 It’s what Sherry Turkle calls “a perfect storm of confusion about what’s important in our human connections”. It’s not the people around us that do this. When I was on Facebook I always felt the need to check it whenever the world around me wasn’t that interesting. In every meeting, for instance, I checked my phone more than three times an hour! Nowadays I realize that the digital world, which is also part of the real world, was (and still is sometimes) of way too much value to me. So many new ways to share less personal things with each other. Time to go outside.